A stunning fourth-quarter comeback led by Allen Iverson. A thrilling final-minute shootout between Stephon Marbury and Kobe Bryant. The ball in Bryant's hands for the last shot. A pass that no one expected. A last-second miss. A postgame celebration worthy of June. Yes, it was quite an All-Star Game. Iverson, Marbury and his Eastern Conference teammates transformed what looked like a blowout loss into an improbable 111-110 victory Sunday in a performance fitting of the 50th anniversary of the game. "It was like a championship game out there," Dikembe Mutombo said. "I've been in the All-Star Game the last seven years, and I've never seen anything like this." It was the kind of game that might stop people dismissing the East as far weaker than the West, the kind of game that might make the casual fan appreciate the heart and determination of some of the younger stars trying to seize the spotlight in the post-Jordan era. Mostly, it was kind of game that any fan of any sport would prefer to see — a riveting one. Iverson scored 15 of his 25 points in the final nine minutes, and Marbury hit two three-pointers in the final 53 seconds as the East came back from a 21-point deficit. Bryant, the NBA's leading scorer, could have taken the last shot. Instead, in a shock to everyone sitting in the building and watching on television, he threw a pass that resulted in a last-second miss by Tim Duncan. "Everybody was saying we couldn't win because of our size. It's not about size. It's about the size of your heart," Iverson said. "Coming into the fourth quarter, we were all sitting on the sidelines saying 'Why not us? Why can't we be the ones to come back from a 19-point deficit (after three quarters) in an All-Star Game?" While presenting the MVP award to Iverson, NBA Commissioner David Stern, with a sly grin on his face, told Iverson that great basketball "can be wrapped — if you pardon the expression — in very small packages." The comment was a clever reference to Iverson's height -- he is an inch or two shy of 6 feet -- and Iverson's rap album, which was criticized for its lyrics and led to a meeting with the commissioner. Iverson, who starred collegiately in this city at Georgetown and had a large contingent of family and friends in the arena, presented his MVP trophy to his mother. "My family, my friends, everybody that's been with me through my struggles and pain knows it's a tribute," Iverson said. "I think it's going to be beautiful for years to come because every year it seems like we get somebody else with a different kind of God-given ability to add to this league." The East trailed 95-74 with nine minutes left after the West dominated the first 39 minutes behind its superior size. It appeared the game would come out looking like a mismatch that would back up all the Western Conference superiority theories that have been thrown around so frequently this season. But the East started pecking away, and Iverson walked over to the scorer's table during a timeout and asked if anyone wanted to wager whether the East would make a comeback. That's exactly what the East proceeded to do, with Jerry Stackhouse and Vince Carter making three-point shots that were followed by a three-point play by Iverson to cut the West's lead to 100-96. Iverson scored the East's next two points from the line, and Tracy McGrady tied it on a putback with 3:10 left. "We had every reason to make this like a regular All-Star Game and lay down and stop playing, and it didn't happen," East coach Larry Brown said. "I had no idea we could come from behind. It was a wonderful ending for us." Iverson scored the East's next five points, and a chant of "M-V-P! M-V-P!" was heard after his two foul shots gave the East a 105-104 lead. But that chant might have revved up someone else, instead. In a down-the-stretch performance reminiscent of his play in the Lakers' Game 4 overtime victory over Indiana in last year's NBA Finals, Bryant kept getting the ball and putting it in the basket. His short jumper made it 106-105, and his 20-footer gave the West a 108-105 lead with a minute left. Marbury, ecstatic over making his first All-Star appearance, tied the game on a three-pointer with 53 seconds left. Bryant answered right back with another jumper, but Marbury did him one better with another three-pointer that gave the East a 111-110 lead with 28 seconds left. The West set up for a final shot after inbounding with 10.9 seconds left. Bryant got the ball, but with most people in the building expecting him to shoot, Bryant faked Marbury off his feet and then threw the ball to Duncan for a short shot that missed just before the buzzer. "I was actually expecting him to shoot," Duncan said. "I was wide open, he got me the ball and I should have finished it. It just didn't go down. It was a great final four minutes." Prior to that, it was almost an embarrassment for the East. The East fell behind 11-0, committed 10 turnovers in the first quarter and seemed incapable of stopping any of the big men from the West. 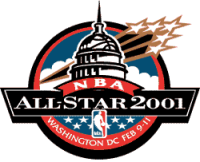 The starting frontcourt of Duncan, Chris Webber and Kevin Garnett finished with 14 points apiece, although Duncan was scoreless and Webber and Garnett had only two apiece in the fourth. Iverson finished with 25, Carter had 16 and Ray Allen 15. Mutombo grabbed 22 rebounds. Bryant led the West with 19. "To win the game at the end of the game the way we did after being down by 21 showed a lot of heart," Marbury said. "To be able to hit some big shots at the end of the game and help us win it was a great chapter. It was beyond my dreams." Despite the lopsided first quarter, there was an early defensive intensity of the type seldom seen in All-Star Games. Tracy McGrady swatted away Bryant's first shot, a jumper, and Duncan retaliated by rejecting a dunk attempt by McGrady. But while the West quickly recovered by pounding the ball down low, the East kept up its mistake-prone ways and errant outside shooting to such an extent that it was 11-0 by the first commercial break. A Webber-to-Garnett alley-oop play made the score 15-2, and the West took a 30-17 lead into the second quarter thanks in large part to 10 turnovers by the East. The East started to run more in the second quarter with Ray Allen scoring nine of their first 11 points. Carter spun 360-degrees in the air — just like he did in last year's dunk contest — for a dunk that made it 45-36 with five minutes left in the half. Carter converted a three-point play with 2:27 left in the half to make it 49-44, then slammed home a crowd-pleasing windmill dunk that made it a three-point game. The West's Jason Kidd hit a wide-open three-pointer from the corner before sinking a shot from behind midcourt at the halftime buzzer to make it 61-50. Bryant bounced an alley-oop pass to Garnett off the backboard early in the third quarter for a one-handed slam that gave the West a 69-54 lead, and Antonio McDyess closed the quarter with a follow slam to give the West an 89-70 lead entering the fourth.